Ask any venture capital company for the key ingredient that persuades them to invest in a company and they will all say the same thing – the people. A commercial idea is essential but unless the people pitching it have the character to triumph over adversity they are unlikely to get the funding they need. Steve Collins and Hugh Reynolds had it spades, according to Frank Walsh, partner in Enterprise Equity Venture Capital. The two men had an impressive track record with Havok and Kore, two game middleware companies they founded and subsequently sold. 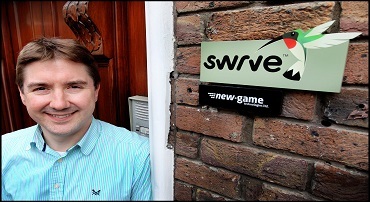 The regional venture capital company would become the first investor in their new venture, Swrve, as it was about to embark on a go-to-market journey that would highlight why the calibre of the people involved is so important. Started as an in-game platform, the firm was doing nicely, if not spectacularly, when the iPhone launched in 2007 and the apps market was born. Collins and Reynolds saw a fundamental shift in the software market and a much bigger opportunity. “Free and low cost apps were hugely disruptive and became fundamental to mobile marketing automation, which is what we started moving towards,” says Collins. Many startups go through a ‘pivot’, a strategic change in direction to capitalise on a market opportunity, but this was more radical, according TO Frank Walsh. “When you make a pivot you are still generally pointing in the same direction. “What Swrve did was an about-face which involved coming up with a completely new product aimed at an entirely new and different customer base,” he says. It was also the meeting that would vindicate Enterprise Equity ‘s faith in Collins and Reynolds. “You invest in people not a proposal because proposals change; people don’t,” Walsh says. Identifying a new opportunity is one thing, commercialising it is quite another. Steve Collins advises every start-up to spend less time writing five-year business plans – “because no-one really knows what’s going to happen” – and concentrate more on partnering customers to get the idea into the marketplace. “Don’t spend three years engineering a solution you think is going to go take the world by storm when you release it,” says Collins. After several pivots and pilots, Swrve arrived at the marketing automation product it sells today. The solution optimises customer engagement through mobile apps that companies are increasingly using to get closer to customers. Swrve’s platform takes signals from customers’ in-app and responds to them in real time. “Simultaneous conversations with millions of customers,” is how Collins describes it. This big idea plunged Swrve into a very hot space and attracted funding from Atlantic Bridge, an Irish venture capital company that invests when it sees a mature idea with a sizeable market opportunity. It led a US$6.25m funding round that propelled the firm into a new phase of growth. More recently, the company raised $10m in a round led by US investor Acero Capital. Today, the company employs 70 people with offices in Dublin, London, New York and San Francisco, and it’s monitoring more than three billion transactions per day across more than 750 million users for customers that include Sony, Activision and Electronic Arts. For Collins, chief technology officer, and Hugh Reynolds, chief strategy officer, Swrve has become a different kind of start-up from their earlier ventures. “The market potential is enormous and Swrve has a greater opportunity to scale,” says Collins. As the firm delved deeper into marketing automation it needed to recruit marketing expertise, including chief executive Christopher Dean, who is based in the company’s headquarters in San Francisco. To grow market share in an increasingly competitive sector, the long-term plan is to differentiate with backend technology that is ahead of the curve. All the engineering takes place in Dublin and it’s the heartbeat of the company. Collins was a Trinity College graduate and retains his ties with the university where he is an adjunct professor. This keeps him in touch with the up-and-coming talent needed to stoke the innovation that is central to Swrve. “We’ll continue to base our engineering in Ireland where we access some of the brightest students coming out of college. In the last year alone, we’ve taken on 12 engineers,” he says. When it come to investors, he speaks highly of the partnerships with Enterprise Equity and Atlantic Bridge. He calculates that he’s been through 14 investment rounds at this stage and while the landscape is constantly changing, some fundamentals stay the same. He wants to see self-confidence but is wary of start-ups too wrapped up in their vision to see the wood for the trees.